New! Receive your free “Vital Vaccine Info” e-book. I was asked again, recently, if we vaccinated our children. Before I begin, I believe in parental freedom of choice whether to vaccinate or not. I hope we can all respect each others choice to decide what is best for our individual children and resist the temptation to judge one another. As an RN and mother, I’ve been researching this topic in depth for quite a while (spurred on by an adverse reaction in my first son with his first (and only) MMR back in ’91), and I have many reasons for not trusting common vaccine science. 1. You really should be concerned about the toxic ingredients in vaccines. Injecting neurotoxins like aluminum and formaldehyde, aborted fetal cells, multiple antibiotics and various animal serums into the body is going to cause a lot more harm than even a rough week of the measles or chickenpox…. In my cost-benefit analysis, the chances of my child being harmed from vaccines is far greater than the chances of my child being harmed from one of those illnesses. Once you digest this fact, you will understand why there should be less fear about diseases and more about vaccines. Many moms are coming to this conclusion! 2. Read the latest pilot study of unvaccinated vs. vaccinated children which found significantly higher rates of allergies, chronic diseases, ear infections and learning disabilities in those vaccinated on schedule. I posted on this here. Who do you think will grow up to be healthier? 3. Can someone please explain how we survived the 1980s with vaccination rates well below “herd immunity” thresholds and far fewer vaccines? 4. Vaccines aren’t as effective as we are told. Actually there is a huge failure rate. That’s why booster shots are given so often. That’s also why highly vaccinated populations show just as high rates of disease. 5. The diseases we vaccinate for are mild and build lifelong immunity. Why risk a forever vaccine injury? The immune systems of normally healthy children do the work and the diseases leave with no serious, lasting effects. An excellent natural cure is Vitamin C. Frederick Klenner, MD., observed that high doses of vitamin C could quickly dry up chicken pox and cure measles, polio and hepatitis. Between 2005 and 2014, there have been no deaths from measles in the U.S. and 108 deaths from the MMR vaccine. 6. I don’t believe that vaccines played much of a role in eliminating diseases. History offers little evidence that vaccines are responsible for eradicating disease even when “herd immunity” vaccination levels have been reached. 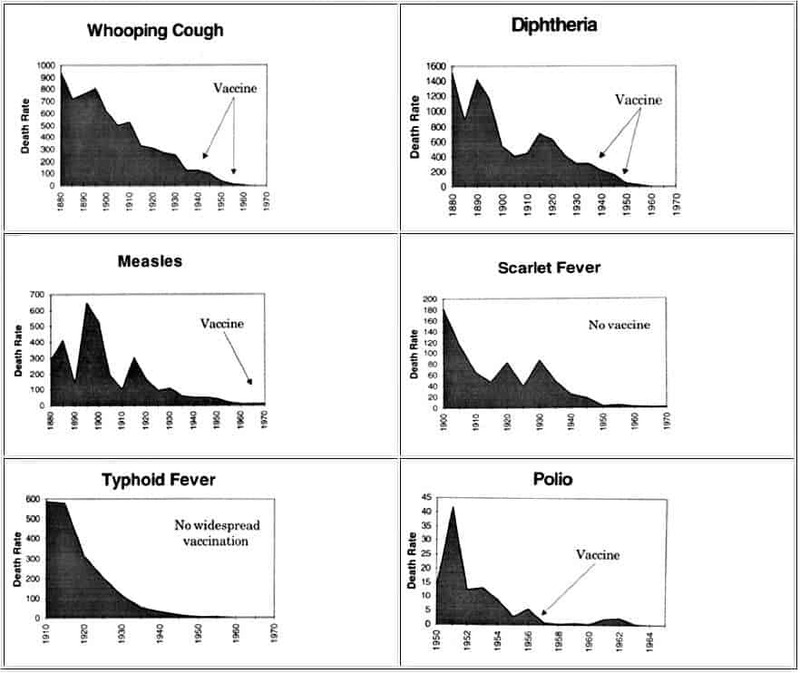 Most of the diseases we vaccinate for today were already on a steep decline before their respective vaccines were widely introduced. Before you laugh, since this may go against everything you’ve ever been taught, I’d ask you to look into this further with actual CDC statistics (see CDC Fig. 1 graph) where arrow says Passage of Vaccine Assistance Act! No, there’s not fetal tissue in vaccines (a common misconception), there are unavoidable traces of fetal cells/foreign human DNA in many of them. I cannot support a medical practice that benefits from abortion, but no matter your views on abortion, you have to admit that there’s a flaw with this practice. NO safety studies have been done on the effects of foreign DNA in the bloodstream. Adverse events are listed on the vaccine package inserts themselves if we would take the time to read them. Your doctor probably won’t show you these. Adverse events are NOT rare. That’s why the Vaccine Injury Compensation Program in the USA has paid out over $3 billion in vaccine injury compensation claims. Not the one-in-a-million case as we are lead to believe. In an open letter to senators, immunologist Tetyana Obukhanych, PhD, states unequivocally that unvaccinated children pose no additional threat/risk to vaccinated children. The Johns-Hopkins patient guide to caring for the immuno-compromised once contained information warning patients to stay away from those recently vaccinated. Interestingly, it has been changed, I believe, under pressure from those who reap huge financial benefits from vaccine sales. Next time you hear someone blame unvaccinated children, please remember who is really spreading these diseases. 11. Those trying to teach about vaccine dangers have only one motivation: to prevent more suffering. We have either witnessed it first hand in our own family or know those who have. 13. All those years ago, it wasn’t too late for me to change my mind when I saw what it did to our first child, and it’s not too late for you to change your mind, either. If you decided to vaccinate and now regret it, you can still detox. This article is written with grace and love. Thank you for taking the time to put it together. I am saving it on my phone for a handy, comprehensive list of concerns and data that I can share with others when this topic arises. I now believe my baby was injured by vaccines. She was diagnosed with arthritis in 1997 at the age of 16 months. Unfortunately, I was not clued in at the time, and the doctors dismissed a vaccine injury, so I continued to inject her with toxic material. As a mother of grown children, this is something I would dread if mine were young. 30 years ago, there was not the number of vaccines that are being pushed today. My husband was never vaccinated as a child (except for tetnus as needed) and had a bad reaction to a flu shot just a few years ago. Our children were on a much delayed, minimum vaccine schedule, and we experienced Whooping cough first hand, and survived! HOWEVER, today’s vaccines are very different with all the additives that are very dangerous to some children and I believe it should be every parent’s right to decide for their family! I appreciate this information and hope it is a help to parents! I am fascinated by that story, too! The big difference is that there are/were NO neurotoxins added to it! Thank you, Mandy! That is my exact wish, too! Blessings! Just remember that the ingredients in vaccines can cause far worse reactions, even if it prevents the visible sign of the disease. It seems a lot of people forget this point. Cancer, autism, adhd, etc. So while a child may not get small pox, their future health is severely compromised. Not trying to argue or diminish your post, just something it seems many people overlook. Caylen….Do remember that no matter WHAT a doctor or nurse tells you, you still have the right to refuse. When your child reaches school age, then you can look at decisions again regarding vaccines. That’s very true – thank you, Anna! Caylen, you may find these series very informative: The Truth About Vaccines and Vaccines Revealed. I would also suggest researching the work of Dr. Andrew Saul, Dr. Levy, and Dr.Suzanne Humphries. If we want to stop immunizing out kids how do we deal with the school systems and kids activities (sports) that require them? Can you please give me some advice on how to go about this? You might be able to get a religious/conscientious objection waiver, though many districts/organizations don’t allow those. For those cases when it is a requirement for an activity, I would suggest that you remove your child from that activity. If it is a requirement for school, I would remove your child from school and begin homeschooling (this blog has lots of resources on homeschooling), or find a private school that allows an exemption from vaccines. It is increasingly hard to live out our convictions in this day and age, even on matters of the health of our children. Even worse, those of us who have educated ourselves on this issue meet with opposition not just from the world, but also from those within Christianity who have placed their trust in doctors instead of God. I hope you can find the encouragement you need. I will pray for you and your family. THANK you, nymalous! Wise encouragement in your words! This is what I found by each state. I hope it helps you and many more! Religious exemption. We are ALL free to decide what we need for our bodies and families, it’s a God given right. Unfortunately some of the young people do not believe this. I had no idea there was any danger when my boys were little. Thank the LORD they had no reaction but possibly they were not as bad then as they are now. I appreciate this article so much. What I find difficult is finding a doctor who thinks this way or will even agree to disagree. My daughter-in-law has had a terrible time finding a doctor. Do you have any ideas for how to find Ann agreeable doctor in these times? I hope that helps you, and I’ll pray you find what you are looking for!! I personally think that the reason you are having a hard time finding a doctor who agrees with this is because the vast majority do not believe in this. I’m on board with this topi from your prospective. Though our children were vaccinated (back in the mid 80’s) thankfully we had no serious side effects. But I’m seeing the vaccine “rate” go up and up and up! By that I mean, the amount of vaccines given to newborns and very young children has increased greatly from the days when our boys were young. It’s very saddening. As a former teacher, I saw more and more kids with “learning disabilities”, ADD, ADHD, etc. rise too with the advent of more vaccines. Why doesn’t anyone see this? I correct myself: People DO see this but choose to believe what the government tells them. The government in this case is fueled by Big Pharma…the guys who make the vaccines and benefit financially from them. If I was a young mother today, I’d hold out on vaccines as long as possible. Yes, many schools won’t let your kids attend without being vaccinated and I suppose I’d have to home school then….a resort not always possible for some families. Now, as a grandmother of two, currently ages 6 and 3, I pray that they will not be affected by vaccines and that their parents will take a look at possible side effects and weigh their options first. Sadly, when one parent comes from a family where someone has a medical background, they believe that “side” without thinking for themselves. If only Big Pharma didn’t have so much weight in our world, we might be able to change a lot of things around to a healthier, more natural approach. Sadly, I don’t see that happening anytime soon………. An example I’d like to cite is cancer treatment. Yes, there ARE other treatments out there besides, chemo, radiation and even immuno therapy. But most people choose to go that route for two reasons: 1) Their doctor (who many think are god-like!) said so! and 2) Insurance won’t pay for alternative care in most cases, thus creating a dilemma for the patient: If I choose alternative therapy, it’s all out-of-pocket expense. If I go the traditional route, at least the insurance will pay. Thank you so much. THis is such a wonderful conscise article that I would like to share too. Its just that the footnotes do not appear at the end of the article and that would really help in the sharing. I searched other parts of your site to no avail, thinking it may be in another category with the footnotes. Can you please let me know? There are live links all the way through and so they are not set as footnotes at the bottom of the post. I checked, and they are all live and to the correct studies. For example, see under #9 (Your vaccinated child(ren) will be shedding their live virus vaccines (this includes the measles and chickenpox vaccine) after their shots). There are 1 through 12 as little numbers and each is a live link. Right click and open in a new tab! Oh!! Thankyou for clarifying that. Will check the live links! Thankyou so much for all the information! I have believed this about vaccines for many years, and now there’s more support against them than ever! My complaint is about my EMT 43 yr old daughter who works in a clinic. She has refused to take the flu shot and they “punish” her by making HER wear a mask all day at work ! Isnt there a way she could legally be relieved of that crazy duty?? This is actually bullying and a way to intimidate and shut those who disagree up! Just having gone for physical therapy at our hospital I found personnel wearing masks and was relieved that they did not have to choose the flu shot or their jobs and had an option. It must be cumbersome especially for a treating health practitioner to wear a mask but as the mother of vaccine injured children I celebrated in what an affective statement was being made to the broad public via health care professionals especially, and their position on vaccinations. I guess that is one way to think of it. I so wish that everyone knew what I knew about vaccinations and even feel responsible to share as Jacqueline does so gracefully, but your daughter can impact others “without evening opening her mouth”. Aww, thank you for sharing that perspective, Diane! It IS an eloquent way of stating that they have refused the flu shot! Maybe some will see your comment and realize that health professionals by the many thousands say ‘No’ to the flu vaccine! I understand the inclination to be concerned about this. I have spent a lot of time reading on it too. Some of the links you cite in no way support the points you are making. Yes, sanitation and antibiotics also contribute to improved health today, but the data clearly show in the influence of vaccines too. It’s completely untrue to say highly vaccinated populations show the same rate of disease as unvaccinated. When did you last know someone in the US who got polio? Smallpox? These are terribly dangerous illness that took so many lives in the past. These are major accomplishments, and clearly accomplished through use of vaccines. Some of the current vaccines are for less dangerous diseases, it’s true, because they attacked the worst first. But it’s also untrue that no-one dies from measles, rubella, chickenpox, etc, merely that the rates are lower. It’s also unrealistic to state that unvaccinated people are not a danger to those at most at risk. For instance, whooping cough is easy to pass around and not as serious for those who are older, but can most definitely be deadly for the very young. It’s a very serious illness. I know plenty of unvaccinated people who have gotten it, none who are vaccinated. It’s not impossible, but it’s much less likely – and your doctor will tell you that, there is always some remaining risk of contracting the disease. Obviously, it’s true that you must use caution after a live vaccine. Any responsible healthcare provider will tell you this. If you need to visit someone in poor health, time your vaccines accordingly. This does not negate the risk the unvaccinated population can pose to the young or otherwise vulnerable. The evidence for vaccine injury tends to be quite emotional and involve small sample sizes. This does not make for good research. Unfortunately, in all situations involving something as complex as the human body, there are multiple causes to the outcomes we see. Unless we are looking at large sample sizes and controlling for other issues, it’s just not strong evidence. I’m a homeschooler, I’m pro-life, and I’ve very seriously concerned the vaccine question. As a librarian with a scientist husband, we’ve dug into in depth. But I can’t in good conscience fail to protect my children through vaccination. I think if there was a clear, strong case to be made against it, I would have been convinced, but it’s not there. I’m confident your intentions are good, but I would kindly suggest trying reading some things NOT just from the anti-vaccination side and truly considering both. The elimination of polio was semantic, not real. Following on the heels of the release of the Salk vaccine, the government radically changed the diagnostic parameters of polio, automatically eliminating 90% of subsequent diagnoses – literally 30,000 cases a year we were then told, and are still led to believe, were prevented by the vaccine. That’s not disease eradication, that’s a parlour trick, a con game. The CDC controls public perception with the point of a pen. My vaccinated child caught whooping cough. The pediatrician did not diagnose it as such because he still had antibodies in his system. He had it but because he had the vaccine they refused to recognize it. Jacqueline, I find this post to be helpful and well-done. As pointed out, the vaccine question is very serious. How is it, though, we can hear absolute RANTS about “my choice”, yet when it comes to vaccinating “MY children”, “MY choice” is dismissed? (Rhetorical question.) There was a series recently offered on-line, “The Truth About Vaccines”. Those who choose to deny the truth would question the science behind the presentation. The series was very well researched and presented in an intelligent manner. I find it interesting that it is usually those who are not dealing with a vaccine-damaged child dismiss the real–not just emotional–physical damage done to the child. Perhaps the small sample size is a result of many adverse vaccine reactions having been dismissed and/or under-reported. For those parents who want to run the risk of vaccine damage to their children and have their children vaccinated, fine. But for those who chose not to vaccinate, please allow those parents THEIR choice, too. If vaccines do what we are told they do–protect the vaccinated person from disease–then there should be no worry on the part of the parents who have vaccinated their children. An unvaccinated child cannot possibly harm/cause disease to a fully vaccinated child. But that’s IF the vaccines work. Jacqueline, I thank you for this post. It is very thought-provoking. God bless you! The concern is that unvaccinated people cause risk to those who cannot yet be vaccinated (the very young) and those with compromised immune systems. I don’t think there’s any doubt about the risks for these groups. If you choose to not be vaccinated, you are choosing to increase the risk of spreading these diseases to those who are naturally more at risk and can’t be protected. For instance, part of why we have chosen to do most vaccines is to protect my elderly grandmother and others in her nursing home. My biggest concern with all of this is that people are making decisions on very poor information. I don’t think anyone would dismiss the terrible stress of having a sick child. There simply is not solid data to back up the claims of those who advocate not vaccinating. There are stories, and they can be compelling. The real evidence is not there. * If your doctor proposed a course of treatment to you based on some stories and not real data, you would probably be outraged. * However, people read some things on the internet and make significant decisions based on very limited information. Some of the doctors, etc., presenting this information are making good money doing so – I’m sure we can all think of some popular websites with this kind of information. They have a financial interest in keeping you reading and keeping you upset. My hope in this area, and really in all areas we can learn about, is that people would learn better information literacy. Be sure what you are reading is true. Be sure that the claims presented are back up by real data that is relevant. Especially when dealing with big, important decisions, do not be swayed by emotions, but analyze carefully. Our kids are worth the effort. Jennifer, if you are concerned about the elderly and the very young, you may want to continue reading. It is not just FluMist and there are doctors that still use FluMist. Besides, shedding, there are big downsides to flu vaccines (listed below). Despite that, the CDC recommends it: “The CDC’s Advisory Committee on Immunization Practices (ACIP) recommends that all Americans six months of age or older get a flu shot every year throughout life. The CDC states that babies between six and eight months old should receive two doses of influenza vaccine one month apart. Hello Jacqueline, You mention the influenza shot shedding. Can you send me information that confirms this? I’ve always heard it didn’t. Thank you. This is really terrible b/c it states it HAS NOT been studied in immunocompromised people! I hope I am answering your question, and thanks for asking! So to be clear then, it’s only FluMist, which from what our doctor is telling us this year is no longer thought to be effective, and thus they are no longer offering it. The regular flu shot is not a shedding risk. Also only live vaccines shed. So if it is not the flu mist and the actual shot than it does not shed. Only the flu most will shed. Because it is a live vaccine. The shot version is not a live vaccine so it does not shed. Read “The Johns-Hopkins patient guide to caring for the immuno-compromised once contained information warning patients to stay away from those recently vaccinated. Interestingly, it has been changed, I believe, under pressure from those who reap huge financial benefits from vaccine sales. Did you read the data in the links of studies in this post and see the page that warning immunocompromised patients to stay away from those recently vaccinated? Also, there are comments her that reference their bad experience with this topic for their immunocompromised child. Great article. The graphs you provided supposedly regarding disease incidence, however – don’t. They speak to mortality, which is perhaps even more poignant, because as the death rates precipitously declined, the infectious illnesses morphed into the mild, immune system strengthening bouts you so aptly described. I host a weekly show, The Vaccine Myth: An Issue of Trust, and would love to interview you, Jacqueline. You can email me at TheVaccineMyth@gmail.com if you’re interested. Thanks. My Grandson Larry Paul died 12-6-16. He is an SUDC child. That stands for Sudden Unexplained Death of a Child. It’s not a diagnosis but a category of death. We believe his death was caused by the DTaP shot he received. He was 14 months old and out of the age range for SIDS so they call it SUDC. I did find another death listed on the VAERS database, another little boy who was 13 months old and had received the same shot, same manufacturer, same lot naumber. I am having further testing done on the autopsy samples to see if we can learn more about the babies death. I appreciated your article, it is factual and well written. Oh, Kathy, I am weeping as I read this! My heart goes out to you and your family! Though, I am sure it is terribly hard, I thank you for sharing your story here. If you ever get to the bottom of this and feel lead, I would be willing to make it into a post to illuminate others that are really looking for truth. May the Lord bless and encourage you. I hope that you and others like you can forgive. Only One I know can help us truly forgive and then we can be free of the damage unforgiveness can do to our hearts and souls. Jennifer, my kid was one of those immuno-compromised ones that vaccinated kids are supposed to be making safer… I was actually instructed by doctors to avoid kids that were recently vaccinated because of the risk of shedding. While she was on chemo I only let her be around people/kids that hadn’t been vaccinated in recent months. I have another friend who has a child that will be on immunosuppressants for life and her son’s rheumatologist told her to not let anyone in her family get any live vaccines. Just saying… Can’t really use the “make other kids safer” excuse with a good chunk of vaccines. How do I detox my kids from vaccines? I was torn and back and forth with my first pregnancy so I did a delayed schedule. They are 4 and 2.5 right now and I will not be getting them anymore vaccines but need to know how to detox them please! Amber, I am working on a post directed at this topic, but it is not ready yet. Please refer to this one as I agree with it, however, I do not feel that fermented cod liver oil is the best IF the testing done on it is true, so why take a chance? How would one detox ber children? I’d love resources and suggestions? Lydia, I am working on a post directed at this topic, but it is not ready yet. Please refer to this one as I agree with it, however, I do not feel that fermented cod liver oil is the best IF the testing done on it is true, so why take a chance? Hi thanks for the article. I am particularly interested in the graphs you have posted showing significant drop in certain diseases prior to the introduction of vaccinations. The links cds you have included in the article does not show such statistics. Can you advise please. It is quite accurate and mind-blowing when you really study it! Also, there is information that has been removed from some of the source material. Sadly, there appears to be some people that are scrubbing articles of vital content!